After months of teaser photos and videos, it’s official. 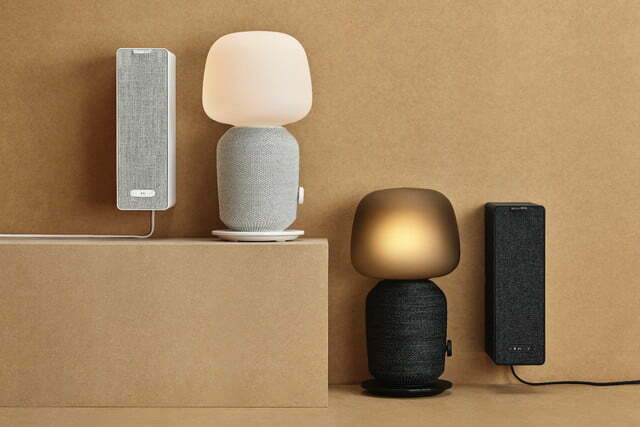 Ikea and Sonos have launched their Symfonisk audio partnership with two new Wi-Fi speakers: A $179 model that doubles as a table lamp, and a bookshelf model that is priced at a remarkably low $99, making it the least-expensive Sonos speaker to date. Both models are expected to go on sale exclusively at Ikea stores and online on August 1. 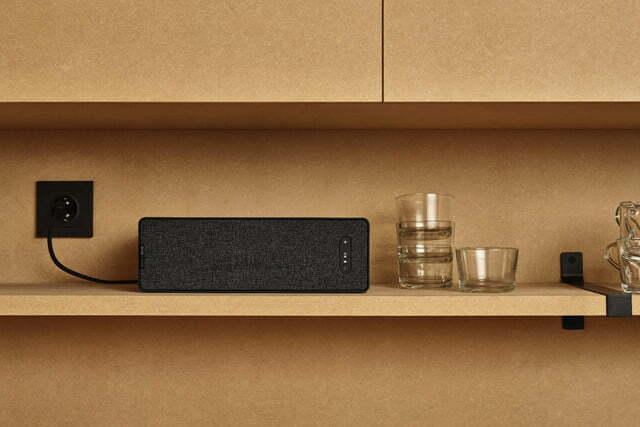 Available in dark charcoal, or white, the Symfonisk speakers will be controlled by the existing Sonos app, and they’re fully compatible with the entire Sonos ecosystem. They can be tuned via Sonos’s TruePlay custom tuning function, and you can set them up as bonded stereo pairs or individual mono speakers. Both have Apple’s AirPlay 2 built-in, which gives iOS and MacOS users the ability to stream any audio content directly to the speakers without using the Sonos app. Like every Sonos speaker, Symfonisk models will have a single Ethernet jack, but no other ports. Unlike Sonos’s most recent products — the Sonos Beam, and Sonos One — these are not smart speakers. There’s no microphone array, so they can’t listen for voice commands, but if you own a Sonos One or a compatible Amazon Alexa device, you’ll still be able to instruct Sonos to play music through these speakers. When Ikea calls the rectangular Symfonisk model a bookshelf speaker, the Swedish furniture company means it literally. 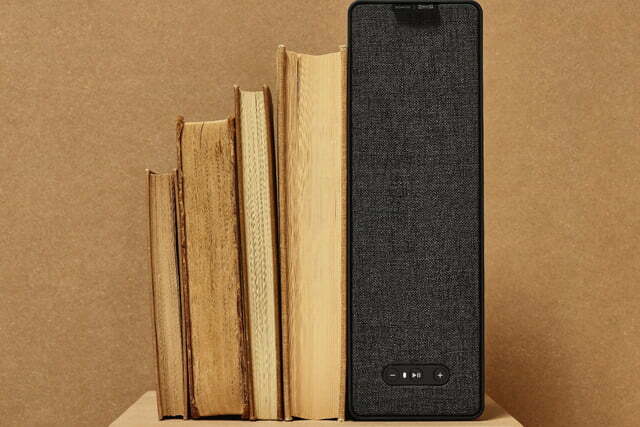 The official name is “Symfonisk book-shelf with Wi-Fi speaker,” and when used with an optional horizontal wall-mount bracket, the speaker can support up to 3 kg (6.6 pounds) of weight. 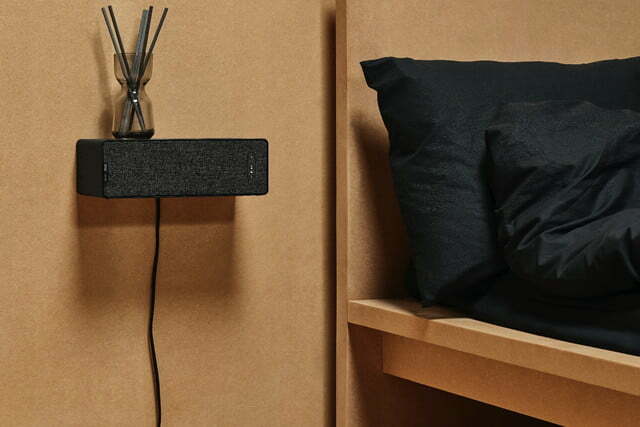 You won’t be able to put much more than a phone, or a watch on its tiny 12 x 5.9-inch surface, but it’s still a viable bedside table replacement for tight spaces. It can also be hung vertically from a kitchen rail, again with an optional bracket. As its low price suggests, the bookshelf speaker occupies a new level in the Sonos lineup sound-wise, sitting somewhere below the Play:1. In an interview with Digital Trends, Sonos product manager Sara Morris was quick to point out that the speaker’s low price is partially due to Ikea’s scale and reach — an acknowledgment that there are economies of scale when dealing with a retail juggernaut like Ikea. As to whether the bookshelf speaker will sound like a cheaper Sonos product, Morris described it as “a little less refined” than a Sonos Play:5, particularly when listening to sources like vinyl. However, the same could be said of the Play:3, Play:1, and Sonos One speakers. Internally, the bookshelf speaker has all the right ingredients on paper, with two class-D digital amplifiers, one tweeter, and one mid-woofer. In our experience, Sonos speakers always sound better than their size and price suggests, so we expect the Symfonisk bookshelf speaker will likely outclass other Wi-Fi speakers in its price range, even if it doesn’t quite live up to more-expensive Sonos speakers. The “Symfonisk table lamp with Wi-Fi speaker,” was the surprise of the announcement. 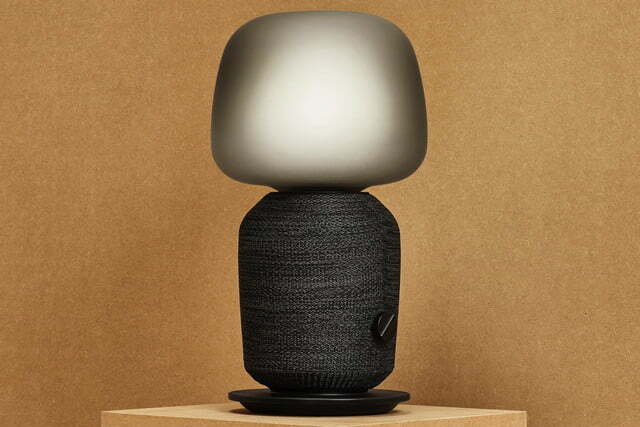 Looking a little like Sackboy from Little Big Planet, it puts the equivalent of a Sonos Play:1 into the base of a table lamp, which can accommodate any standard E26 LED lightbulb, and has an independent power knob for the lightbulb socket. At only 15-inches tall, it’s shorter than the photos suggest. Price-wise, the Symfonisk table lamp represents about a $50 premium over the regular Sonos Play: 1. Though the fabric-wrapped base containing the speaker is perfectly symmetrical, it isn’t a 360-degree design. “It is the same sound profile as the Sonos Play:1,” Morris said, and has to be positioned with the electrical cord at the rear of the space in order to disperse sound correctly. The base of the table lamp acts as both a stable platform to prevent tipping, and the location of the controls. Sonos has chosen physical buttons over its newer, touch-based controls, but the volume up/down rocker from its earlier products has now been split into two separate buttons. The lamp’s completely enclosed shade is made of mouth-blown glass and is “black toned” on the charcoal version, and white on the other version. Because of the fully enclosed design, you’re limited to a 7-watt maximum LED bulb — incandescents or CFLs are not supported. 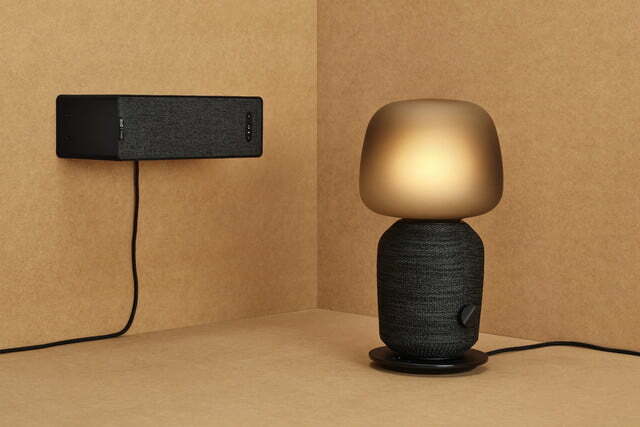 The design of the Symfonisk table lamp (and to a certain extent the bookshelf speaker) is the result of research conducted by both Sonos and Ikea, which suggests that most homeowners end up trying to hide or otherwise minimize the presence of their speakers. With counter and shelf space at a premium, combining a table lamp and a speaker into a single product achieves both the space savings and the invisibility factor. Unlike the bookshelf speaker, which boasts practicality and price, the table lamp model is risky: No one knows better than Ikea how quickly interior design trends can shift, and even if customers love the current design — far from a sure thing — they may avoid buying it for fear that it won’t be as appealing to them in the future. If and when that happens, it will be upsetting to know you’re discarding a lamp and a Sonos speaker. One way Ikea could forestall this inevitable scenario would be to sell a continually updated set of compatible shades. A different shade shape could change the look and feel entirely, as could the introduction of additional colors. Another potential drawback to the table lamp design is that Sonos restricts stereo-pairing to identical speaker types. This means that if you buy the table lamp, and you want stereo in the same room, you’ll need to buy a second table lamp. Despite the fact that the table lamp is an acoustic match for the Play:1, you cannot mix and match the two within a stereo configuration. The same pairing restriction applies to the bookshelf speaker. 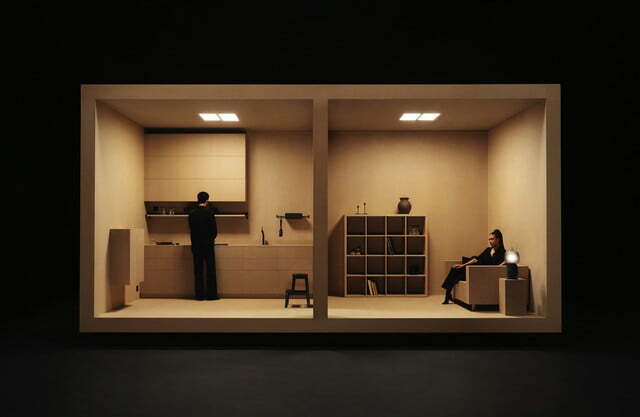 Sonos is on something of a home design roll. At one end of the price spectrum is Ikea’s Symfonisk speakers — an inexpensive way to disguise your speakers by giving them a secondary function. At the other end of that spectrum is Sonos’ line of architectural speakers, which it launched earlier this year. With available ceiling and wall speakers, they let custom installers, or confident DIYers, hide the source of the audio within the home’s structure. We’re looking forward to putting these new speakers to the test, which we will do as soon as review units become available. Check back with us in the weeks leading up to the August 1 retail launch date to get our first impressions.